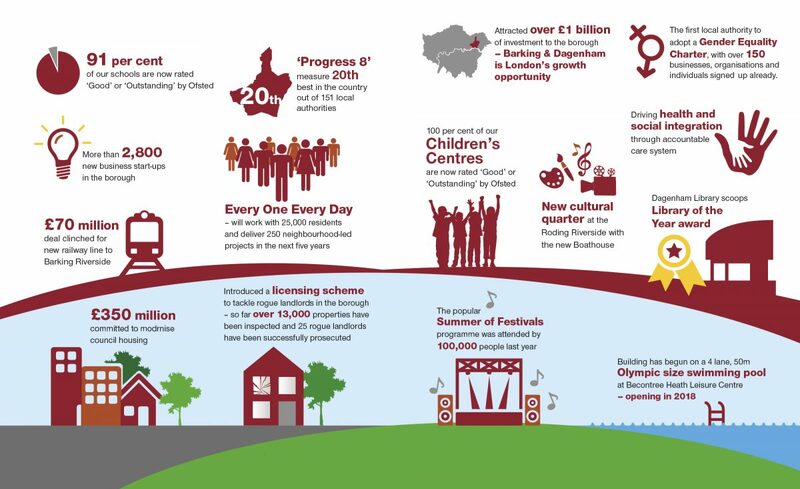 Some highlights of what the council’s current administration has achieved during 2017-18.
attracted over £1 billion of investment to the borough - Barking and Dagenham is London’s growth opportunity. £70 million deal clinched for new railway line to Barking Riverside. £350 million committed to modernise council housing. more than 2,800 new business start-ups in the borough. new cultural quarter at the Roding Riverside with the new Boathouse. building has begun on a 4 lane, 50m Olympic-sized swimming pool at Becontree Heath Leisure Centre - opening in 2018. 91% of our schools are now rated good or outstanding by Ofsted. progress 8 measure 20th best in the country out of 151 local authorities. 100% of our children’s centres are now rated good or outstanding by Ofsted. Dagenham Library scoops Library of the Year award. the popular Summer of Festivals programme was attended by 100,000 people last year. Every One Every Day will work with 25,000 residents and deliver 250 neighbourhood-led projects in the next five years. introduced a licensing scheme to tackle rogue landlords in the borough - so far over 13,000 properties have been inspected and 25 rogue landlords have been successfully prosecuted. the first local authority to adopt a Gender Equality Charter, with over 150 businesses, organisations and individuals signed up already. driving health and social integration through accountable care system. 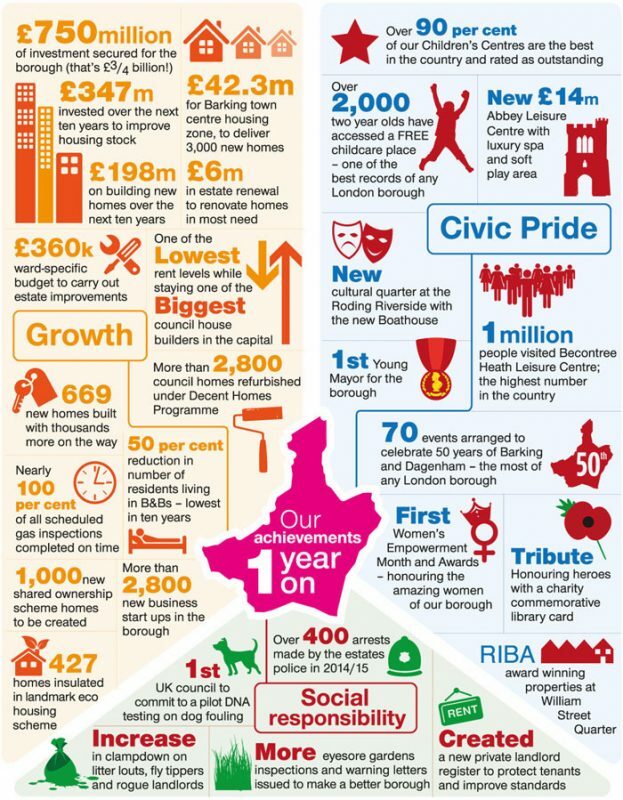 Some highlights of what the council’s current administration has achieved during 2016-17.
over £1 billion investment in new home and jobs secured in the borough. be First, our regeneration and investment company, has been established. planning application for £35 million Vicarage Fields shopping centre revamp agreed. developer selected to build 3,000 new homes at Beam Park Dagenham. demolition of the Ford Stamping Plant started to make way for 2,650 new homes. £1.7 million invested in the Abbey and Barking town centre conservation area. plans for a film studio at Dagenham East backed by the London Mayor. first direct freight train from China arrives in the borough. £42 million secured for Barking town centre housing zone. 2,500 low energy street lights now being installed. 2,650 people found work through our Job Shop. 100% of children’s centres are still outstanding or good. 90% of our schools are now rated outstanding or good by Ofsted. every school in the borough had improved GCSE results last year and A Level results rose for the fifth year in succession. 100,000 people attended our 2016 summer events - almost half the borough’s entire population. highest number of first choice secondary school places in London. £1m savings made in the council’s senior managements. pilot scheme to put more bobbies on the beat. just under 3,000 people helped to draw up our Borough Manifesto for a better borough. 7,500 children are now on our learn to swim programme. monthly visits to the Abbey Leisure Centre have now reached 38,000.
more than 4,300 people have signed up for our garden waste collection service. more than 100 organisations signed up to our award-winning Gender Equality Charter. the Huggett Women’s Centre opens its doors in Dagenham. Over 12,000 private sector landlords registered with our licensing scheme and 25 rogue landlords prosecuted. 70 purpose-built bungalows for elderly and disabled people completed. name and shame launched, helping us catch and fine people for grime crime. our estates teams carried out 251 weapons sweeps last financial year, taking weapons off our streets. £400,000 invested in Chadwell Heath cemetery extensions underway. 140 sites now protected from illegal travellers’ encampments. a record 2,000 people took part in our 7th Play Day celebration at Valence House. Slim Your Bin campaign helps to increase recycling by 9%. we launched a Neighbourhood Plan for every ward. Some highlights of what the council’s current administration has achieved during its second year (2015-16). Some highlights of what the council’s current administration has achieved during its first year (2014-15).